I would like to feature Lynn's blog from last week for the amazing faces of her neighbours she shared from the Halloween celebrations.....I really was impressed so thanks for sharing them Lynn. Sam has been to the opticians and now has to wear glasses. 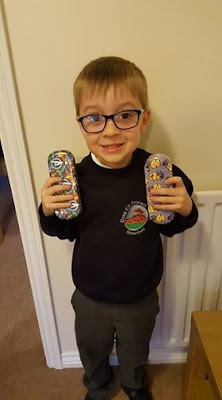 As you can see he's very proud of the two pairs he's got and is being a really good boy wearing them. He did decide to launch a stone at his own face though this week [thankfully he wasn't wearing his new glasses at the time] and now has a lovely black eye to show for it.....get well soon little man. 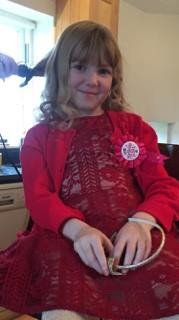 Amy's eldest, Phoebe, has had her 8th birthday this week and here she is having her hair and nails done ready for her party....I can't believe just how quickly those years have gone. She is growing up into a beautiful young lady to be very proud of. 'All I want for Christmas.......' now. 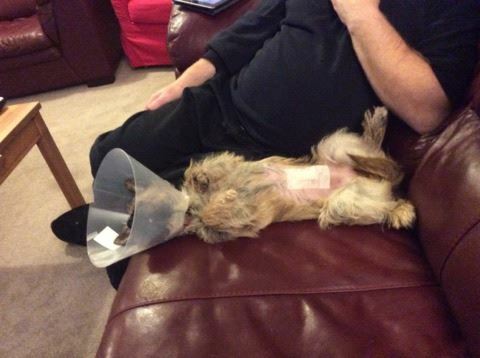 And for all Milly's followers here's a pic to make you smile....we had her neutered this week and here she is lay back on the sofa showing you all her wound! She has recovered extremely well you will all be pleased to know. She has to keep her 'collar of shame' on and not to jump up for 10 days. The collar isn't causing her too much trouble [apart from when she tries to get in small places lol] but stopping her from jumping up really isn't easy.....she such a bouncy little character. There you go.....I've shown you mine now please link up below to show me what's been making you smile this week. Well I'm first up apparently, now that's a first in itself. Another first is being featured, well it's the gang next door really. A mixed week for sure Annie as we both know. Amongst the tears we have to find smiles and I've found some with your gorgeous gang and of course Milly the drama queen. She really knows how to milk a situation doesn't she. A big hug for you dear friend, enjoy your week. Here's a hug for you Annie. It's the cloud and the silver lining thing now isn't it. And as you get older, you will lose more people you know and love. As you say, the loss of younger ones is very hard. I'm sure your gorgeous grandchildren will give you distraction and keep you smiling. And Millie will want attention too, poor thing. Lovely pics of those gorgeous little ones - growing up all too quickly! Well i am glad you are feeling a bit better this week Annie. It seems to take us longer to recover as we get older doesn't it. But we are both on the mend now. I am sorry to hear you had sadness to cope with too.It is never easy. But you have some lovely photos of the little ones to cheer you. Sam looks very grown up in his glasses. I hope he continues to be happy with them. I smiled at the gappy teeth. I have photos of all my boys like that. They always make me smile. 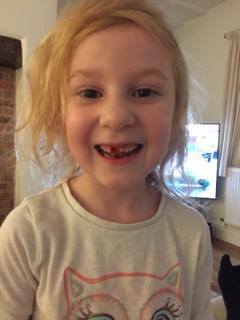 And Phoebe is eight already. The time goes so fast. But it is a joy to watch them growing up isn't it. I am glad Millie is on the mend. They look so very sorry for themselves for a day or two, and then they are back to normal before you can blink. It is a good thing to get out of the way anyway.